Make a stunning addition to your accessory collection with this set of four hair clamps. 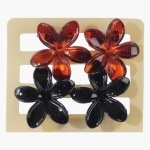 It sports an elegantly designed floral shape. The tiny size is ideal for clipping flyways or small sections of hair.